Beautify your lawn with this unique seed mix. 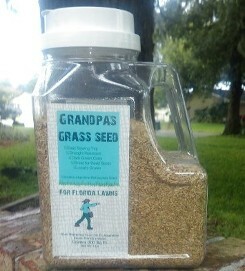 Grandpa's Grass Seed is a mixture of Argentine Bahia Grass and Annual Rye Grass that provides fast germination and fast greening in Florida. This mixture can be used to fill in dead spots in St. Augustine and establish a long-lasting drought-, pest-, and disease-resistant lawn. Once established, it requires half the water of St. Augustine or Floratam Grass. It comes with an easy sowing top, which makes it simple to spread. The Annual Rye Grass provides for fast greening, while the Argentine Bahia Grass will come in later to produce a green lawn that will last. Comes in a 4 pound easy sewing top and covers up to 300 square feet. Bermuda grass is a widely used grass for lawns, roadsides, and pasture in the southeastern United States. The improved varieties are used mostly on golf courses and sports fields. It is a low-growing grass with short leaves and deep roots, which provides good drought tolerance. Bermuda Grass loves warm weather and sunshine and establishes reasonably fast with adequate moisture.